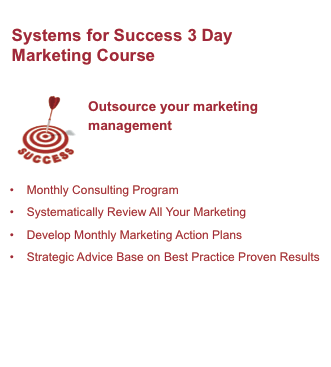 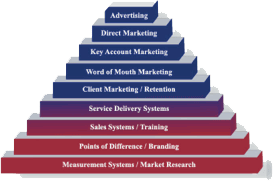 d) How to develop each strategy as system that keeps working to grow your business every month and year to follow. 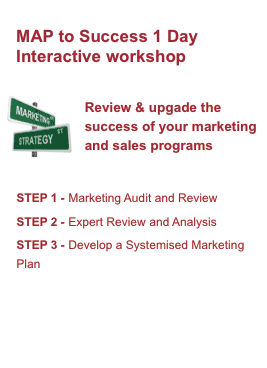 At the seminar, you'll also learn about how to develop your MAP (Marketing Action Plan) to Success, so that you quickly develop a marketing program that will achieve the best Return On Investment for your efforts. 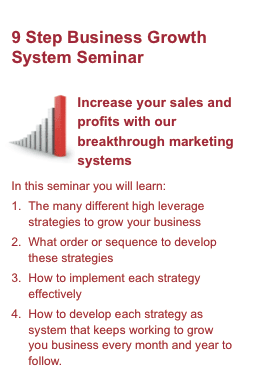 This powerful 90 minute "learning experience" will give you a host of new ideas on how to supercharge your sales and profit growth. 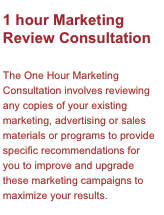 Furthermore, we'll discuss some of the key "Implementation Tactics" for each strategy so you can immediately apply these strategies to your business with considerable success. 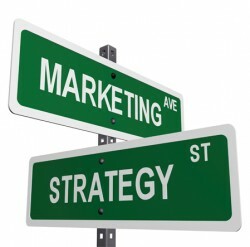 To help you understand the concepts, we'll also provide real life "local" examples of how these strategies have been applied with great results. 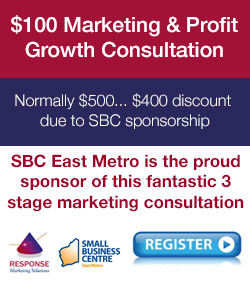 The 9 Step Business Growth System Seminar is offered at the incredible value of $40 per person (inc GST), or $30 per person (inc GST) for bookings of two or more. 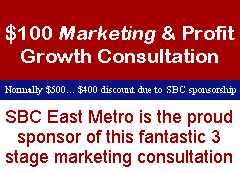 This is an extremely small investment for the many ideas, strategies and systems you will learn that have created hundreds of thousands of dollars in profit growth for the companies that have already applied this knowledge to their business. 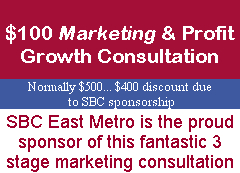 Take the next step to your profit growth. 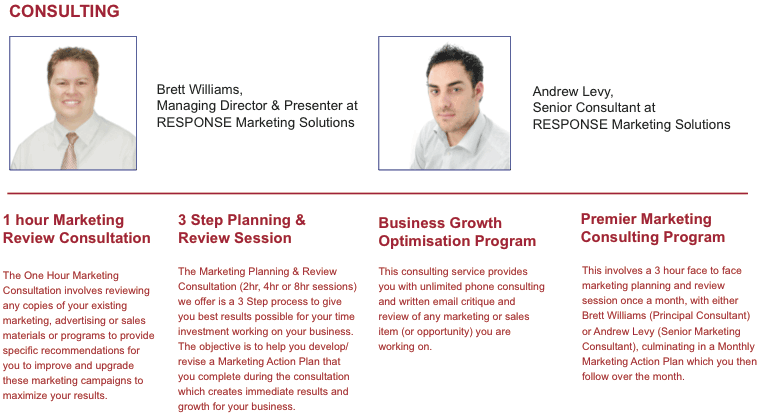 Let RESPONSE Marketing Solutions transfer our knowledge to you so you can take control over the growth of your company and the achievement of its goals. 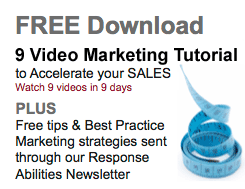 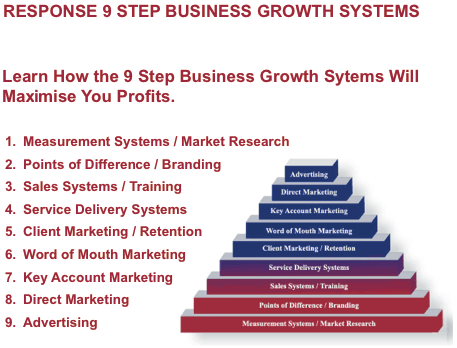 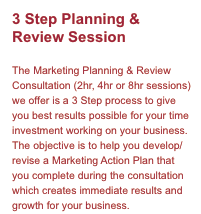 Click here to view a PDF document about the RESPONSE "9 Step Business Growth System" Seminar.